I think most parents who travel to Walt Disney World spend some time thinking about naps or downtime for their children, especially for the younger ones. I've found that one of the most common recommendations - for people of all ages - is to take a midday break and go back to your resort for some downtime, whether that is for a nap, pool time, or just non-park time. Well, we tried it and it doesn't work for us. I think it's solid advice for many, but I'll explain why "stroller napping" won out in our family. When we first traveled to Walt Disney World as parents, our (now) oldest daughter was 10 weeks old. She was still so young that napping wasn't exactly a challenge; she was young enough to sleep bundled up to me in a wrap, and in her infant carrier. Fast forward a couple years, when we visited with our two daughters who were 2½ and 1½ at the time. Naps are hugely important in our family (sadly just for the kiddos). I will humbly admit we were blessed with good sleepers from the get-go. They all slept through the night (12 hours) by the time they were 10 weeks old, and while my middle daughter took a little longer to catch onto napping, we're firm believers in "sleep brings sleep." The better rested they were, the more likely they were to sleep well at night. If we missed the window of putting them down by 6:00 pm, or a nap was off, they became overtired and it affected their sleep. With all that said, yes, we planned (and still plan) our lives around sleep schedules. Activities, errands, and family outings were diligently organized around those nap times. Yes, this is difficult, but it's so rewarding when your children are rested. This also meant our girls slept in their cribs 99% of the time. They didn't doze in the car, they wouldn't just conk out while being held - they needed their dark room, their white noise machine, and their bed. So how did we think we'd nap them in Disney? Well that first trip with two kids, we were staying in a Studio Villa at the Beach Club and fortunately, they have full-size cribs (rumor has it they phased out, but we got one this past September still). We requested two. We planned our days with the intention of leaving the parks to get back to our room for nap time – oh wait, did I mention they always favored earlier naps? They napped better going down at 11/11:30 am than at 1:00 pm as many toddlers do once they go down to one nap. This was a challenge because if the parks open at 9:00 am, and we need to plan on 45-50 minutes to travel back to our resort, we needed to leave by 10:15. Oh boy! Not ideal, but we attempted it. After the first day that we cut our morning very short and rushed back to our resort, the girls were so wound up from a taste of what they could experience at the park, the last thing they wanted to do was nap in a dark room back at the resort! They wanted the action! We spent two very frustrating hours trying to “convince” them to sleep (you can all laugh here). We repeated this again the second day, and then threw the plan out the window! 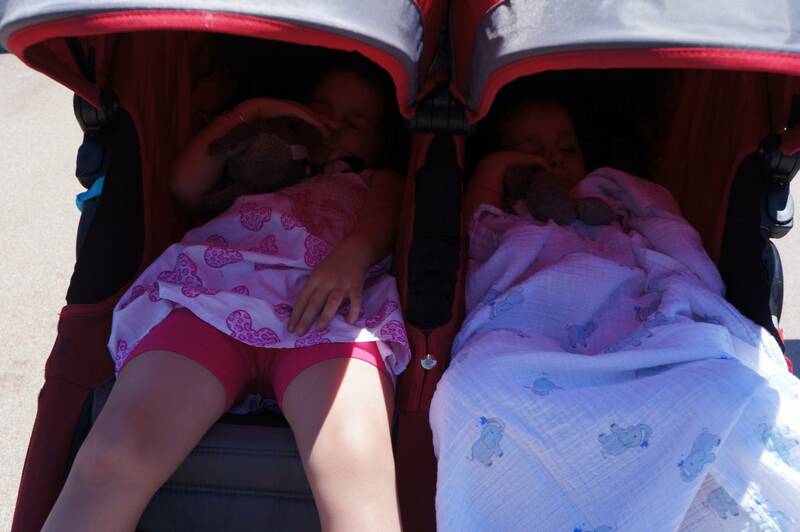 The next day, we made sure they had something in their bellies, then at their naptime, we reclined their stroller seats back, gave them their "lovies" (both had Eeyores), and placed a light, muslin blanket over their canopies so as to minimize distractions, and started walking. 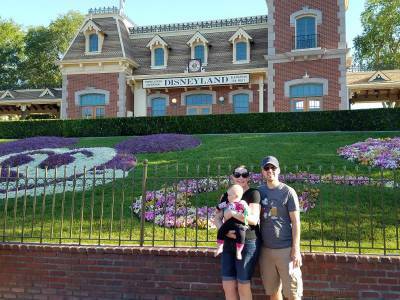 We found a spot in each park that was a little off the beaten path – like Center Street off of Main Street in the Magic Kingdom – and just walked them around and/or pushed them back and forth and they were out like lights. 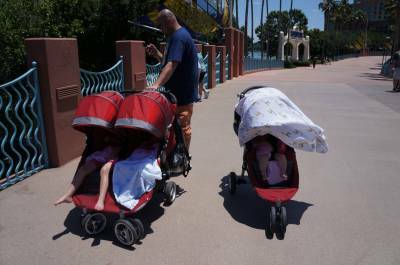 I will tell you that at home a 2-2½ hour nap was common and the stroller only gave us about 1-1½ hours, but we took it! The time we saved leaving the park, to get back to our room, and then return to the park alone was worth it!! Those of you who have ever had to cart a double stroller, bags, and your young ones on and off a Disney bus totally understand. It's not easy at all. I actually love riding a Disney bus, it's nostalgic for me – the smell, the narration, the excitement it builds -- but I will avoid them at all costs as long as we have a stroller! Another point I wanted to share was that we also plan our days around very early dinners; typically the 4:00 pm reservation wherever we were dining, so that we can be back in our rooms by 6:00 pm to get the little ones ready for bed. They all still go to bed for the night by 6:30, so we may not have always made it in time, but we were close. When your kids can't "hang" into the evening hours, you have to take the most advantage of those daylight hours as you can, which is another reason spending time getting back and forth to our resort didn't work for us. When a restaurant we wanted to have dinner at didn't open until later (ie. Chef Mickey';s or Narcoossee’s), we waited until we stayed nearby and nabbed the earliest reservation. So sadly, it was five long years before we could eat at Narcoossees again. We have returned four more times in the last four years, and now have three girls. Our oldest two just stopped napping this past summer. Yep, they napped until they turned 6 and 5! Our oldest has always loved to sleep. Our youngest is now 2 and is the sole napper. But we still sport a single and double stroller and completely rely on the “stroller nap” for our little one. It was actually bittersweet this past September not having all three nap; that was the time, while in Epcot, my husband and I would slowly stroll through the World Showcase snacking and “sipping," without any requests from the kids. It was our time together. We walked around the Boardwalk last year a few times, enjoying the views of our favorite resort and just being together while the girls got their rest. 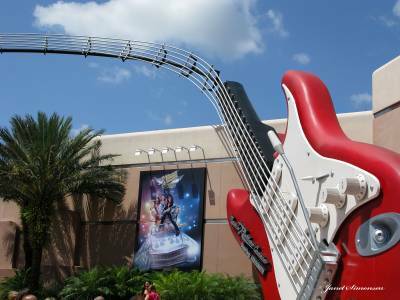 Another nice, quiet walk is from Disney's Hollywood Studios, around the Boardwalk a couple of times, and then into Epcot (or any order that suits your needs). So yes, we still napped our youngest, but…. the older two were tall enough to ride many attractions they never had, and that was a whole new experience we got to share! Again, taking that time midday to leave the park may work really well for others, but don’t feel bad if a nap in the stroller is what works for you and your child. The kids never gave us a hard time; in fact, they would sometimes tell us they were ready for a nap. 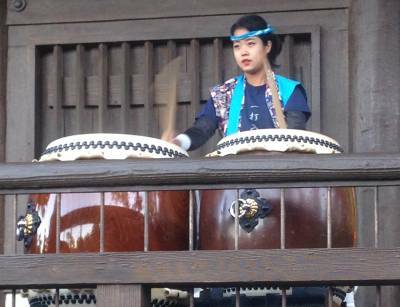 We saw parts of the parks we wouldn't have otherwise seen because we sought out those quiet areas. We maximized our days, and all fell exhausted into our beds in those early evening hours, ready and raring to go early the next morning! Our last trip we had some of our friends and family with us, and stroller naps worked for their babies, too! About the Author: Jocelyn is a working mom who tells her girls when they complain about her having to work, that it’s to save money for Disney! Having visited throughout her lifetime, her most special trips have been getting engaged to her husband in front of Cinderella Castle, and visiting each year with her daughters and experiencing it with them.